Stone says he "will be present for the hearing as ordered." Roger Stone, the veteran political operative and former adviser to Donald Trump, appeared Thursday in federal court to face Judge Amy Berman Jackson, whom Stone targeted in an inflammatory Instagram post earlier in the week. 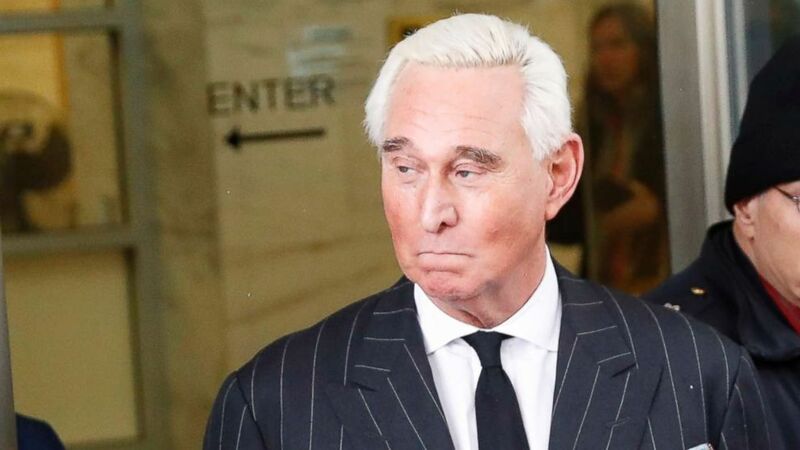 Stone has apologized for the post both publicly and in court documents, but Judge Jackson summoned him to return to U.S. District Court in Washington, D.C., for a show cause hearing to explain why the conditions of his release and limited gag order "should not be modified or revoked in light of the posts on his Instagram account." "Through legal trickery Deep State hitman Robert Mueller has guaranteed that my upcoming show trial is before Judge Amy Berman Jackson, an Obama appointed Judge who dismissed the Benghazi charges again Hillary Clinton and incarcerated Paul Manafort prior to his conviction for any crime," Stone wrote in a caption to the post, which featured a picture of Judge Jackson with a what appeared to be a crosshairs in the upper corner. Stone completed the caption with the request, "Help me fight for my life" and a link to his legal defense fund. In a statement to ABC News on Monday before Jackson's order, Stone wrote, "A photo of Judge Jackson posted on my Instagram has been misinterpreted. This was a random photo taken from the Internet. Any inference that this was meant to somehow disrespect the Court is categorically false. What some say are crosshairs are in fact the logo of the organization that originally posted it something called corruption central. They use the logo in many photos." Reached by ABC News Tuesday following Judge Jackson's order, Stone said, "I will be present for the hearing as ordered." Special counsel Robert Mueller indicted Stone in January on five counts of lying to Congress, as well as witness tampering, and obstruction of justice as part of Mueller's probe into possible collusion between the Trump campaign and Russian election meddlers in the 2016 U.S. presidential campaign. Stone has pleaded not guilty to all seven counts. On Friday, Judge Jackson issued a limited gag order in Stone's case to protect potential jurors from being “tainted by pretrial publicity.” Under the order, which the judge described as “narrowly-tailored,” Stone, known for his frequent and colorful television interviews, is currently allowed to continue speaking publicly about the probe – as long as he refrains from doing so near the federal courthouse in Washington, D.C. But, according to Jackson's order, she reserved the right to expand the order. What's more, she pointed out that any statements Stone made publicly could affect the court's view of any future arguments he might make about whether he is getting a fair trial due to pre-trial publicity. The judge said the fate of any motion on that point could depend on the extent of his own role as the source of the publicity. “While it is not up to the Court to advise the defendant as to whether a succession of public statements would be in his best interest at this time, it notes that one factor that will be considered in the evaluation of any future request for relief based on pretrial publicity will be the extent to which the publicity was engendered by the defendant himself," Jackson wrote in Friday's order.